1/1, January 1901-1903 (? )(volume 3, number 9 is September 1903). 16 pp., $1.00 a year. This is the only way I have of introducing myself to the many sincere and worthy occult students. I will say I was born in Egypt in 1861, educated in Europe (University of Barcelona) and sixteen years of my life was spent in the Orient, including Turkey, Persia, India, and Thibet. I say in plain, honest words that I am the only man in America to-day that has credentials from the Hindoo Priest and the Dalai-Lama of Thibet. I have just printed a neat little pamphlet which fully explains the unforbidden secrets of this strange country. I will send one copy FREE to sincere occult students only; they are going fast. Address Dr. J.T. Betiero, M, 2134 Michigan Ave., Chicago, Ill., U.S.A.
Betiero's alliance with the journal was short-lived and by the beginning of 1903 he had started his own journal, Betiero's Oriental Mysteries, in Chicago as the organ of his Order of Oriental Mysteries; by January 1905, he had transferred his work and the journal to San Francisco and the Philosophical Journal was carrying Betiero's notices for a "School of Oriental Mysticism" in San Francisco, and calling him "Preceptor of the Magi." S.C. Gould's Historic Notes and Queries 26 (September 1908): 213, says Betiero organized the order in Chicago in 1902 and claimed he could "communicate true initiation of the Tarot by mail." Betiero began his career, as did many of these later magi, with a book on hypnotism: Practical Essays on Hypnotism and Mesmerism (Chicago: Zelah & Co., 1897). Reuben Swinburne Clymer (1878-1966) contributed to The Philomathian and incorporated at least parts of Betiero's organizations into his Confederation of Initiates. Various webpages without citing support other than Clymer refer to the formation of a Sacred College of the Magi in 1899 by, among others, Betiero, Willis F. Whitehead, News E. Wood, George V. Bonker, Clymer, and Swami Rakadazan (i.e., Clymer again). The purpose, supposedly, was to carry on the work of P.B. Randolph. Clymer (who published his more magical books under the name "Rakadazan") at any rate did re-publish Betiero's Nedoure Priestess of the Magi, or Blazing Star: An Historical Romance Based on Records Elucidating the Conflict between White and Black Magic; together with Much of the Teachings and Practices of Both (Quakertown, PA: Philosophical Publishing Company, 1958). A version of this novel had earlier appeared in Star of the Magi, a journal edited by Wood and Betiero before the latter went on to this journal and then to [Betiero's] Oriental Mysteries in San Francisco. Clymer says that he began to correspond with Barton about 1897, and that he and Barton about 1905 organized the Philosophers of the Living Fire in which Barton (1869-1943) was Reverend Supreme Grand Rabboni, Clymer was Grand Rabboni, Dr. M. Rogers (Marshall N. Rogers, 1850-1931) was Senior Grand Rabboni, and Jessie R. Barton, D.O. (Jessie Rogers, 1874-1951, daughter of Marshall and (sometime) wife of Henry) was Junior Grand Rabboni—the same cast of characters as the principals of this journal. 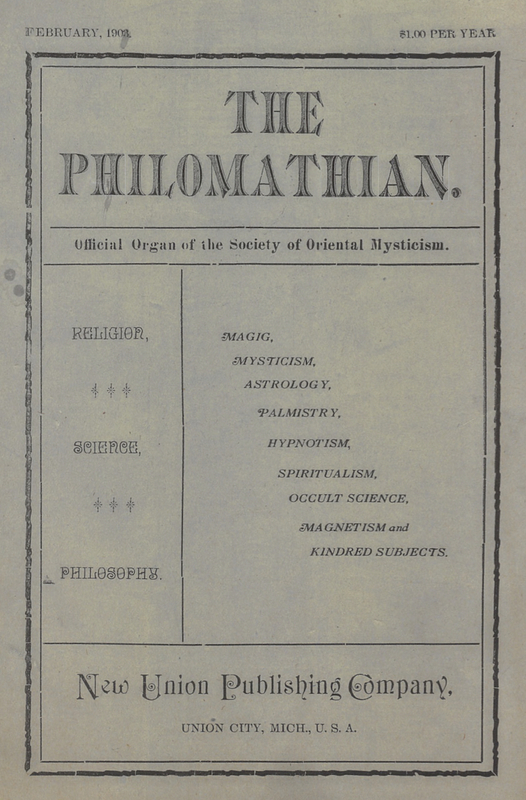 The endeavor began to fall apart when Jessie (according to Clymer) ran off with the printer of the Philomathian; she later re-published The Living Fire in 1908 as Jessie Rogers. The group was enjoined for fraud by the federal government in 1905 and again in 1917. Barton and Clymer also participated in Ira L. Keperling's African Brothers and Ancient and Mystical Oriental Masonry. See the notes under The Egyptian and under News E. Wood's Star of the Magi. University of North Carolina, Chapel Hill.